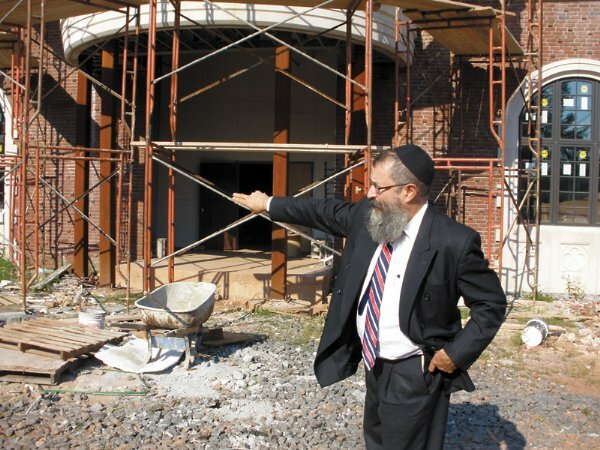 The expected opening within a month of the first stages of a new $12 million expansion at Rutgers Chabad will further cement the university as a “destination” for Jewish students, officials and students say. The 55,000-square-foot expansion will include enlarged dining facilities, a Sephardi sanctuary, and a 72-bed men’s dormitory. With the exception of the dining hall — which is expected to be finished several weeks later — the entire project is expected to be completed by the start of the spring semester on Jan. 17. The facility, already the largest Chabad house in the world, has long had a women’s dormitory. “I have been here 33 years, and if someone had told me back then that Rutgers would be the place to be for Jewish students, I would have told them they were out of their minds,” said Rutgers Chabad executive director Rabbi Yosef Carlebach. Meanwhile, Rutgers Hillel is raising money to build new headquarters to replace its cramped College Avenue building. Hillel hopes to break ground in the coming year on a $15 million facility that will overlook the Raritan River. The university’s Jewish student population jumped from 6,000 to more than 7,400 this year, according to Rutgers Hillel director Andrew Getraer, moving it up a notch from fourth to third among schools with the most Jewish students. “I would not be surprised if in the not-too-distant future Rutgers overtakes [the University of] Florida as the number one destination school for Jewish undergraduates,” said Getraer. Hillel’s recent addition of Rabbi Heath Watenmaker, heading a Reform outreach initiative, makes it the only Hillel in the nation with a Reform, Orthodox, and Conservative rabbi on staff. Another campus group, Rutgers Jewish Xperience, offers courses and trips from an Orthodox perspective. The university’s Department of Jewish Studies has added a master’s degree program, while the Allen and Joan Bildner Center for the Study of Jewish Life offers a wide range of programming. Its public events draw hundreds of community members. Josh Strimber, a senior from Philadelphia who often comes to the campus Chabad to learn, said he transferred to Rutgers from a Pennsylvania college because of its Jewish atmosphere. Josh Herzfeld, a freshman from Clifton, said the campus Jewish life was a major factor in his choosing Rutgers. Much of the university’s New Brunswick campus is encompassed by an eruv, a boundary formed by artificial and natural demarcations to allow items such as keys and books to be carried on the Sabbath and certain Jewish holidays. “We see change is happening,” said Carlebach, whose facility serves as the kosher dining hall for the entire university. It added two new chefs this year as part of an effort to offer more variety. When the new dining hall is completed, it will be able to accommodate up to 700 students per meal. Already the upgraded food selection is evident with such features as a gourmet coffee bar and salad, soup, and fresh fruit stations. Chabad now has eight full-time rabbis on staff engaging students in Talmud study and serving as mentors. “We have not only had quantitative change, but also qualitative,” said Carlebach as he took a reporter on a tour of the new facilities. Unexpected construction interruptions from Hurricane Irene and other severe weather delayed the opening of the men’s dorm and other facilities for months. Students scheduled to move into the dorm this semester are being accommodated elsewhere, said Carlebach. The College Avenue site was a whir of construction activity. Air-conditioned rooms equipped with Wi-Fi and cable hookups were taking shape. Large individual showers were being installed. Dorm residents are not required to be Sabbath-observant or follow a dress code, said Carlebach.